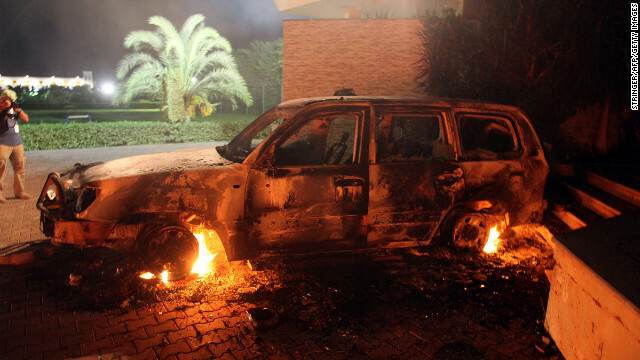 The assault on an American diplomatic post in Libya that left four Americans dead provided surrogates for both presidential candidates with fodder for political attacks Sunday, two days ahead of a critical debate between Mitt Romney and Barack Obama. On CNN's "State of the Union," Romney adviser Ed Gillespie echoed an attack line the GOP nominee delivered last week, insisting that Vice President Joe Biden's assertions at the vice-presidential debate didn't match congressional testimony from State Department officials. "Vice President Biden directly contradicted the sworn testimony of the State Department in the debate the other night. That led to another round of kind of nuancing by the White House," Gillespie said, adding: "There are inconsistencies here, and I think as Americans we deserve to know what really happened going into this attack." Robert Gibbs, also speaking with CNN chief political correspondent Candy Crowley on "State of the Union," rejected the Republican criticism of the Obama administration, saying the president's rivals were seeking political gain from the national tragedy. "We don't need wing-tipped cowboys or shoot-from-the-hip diplomacy," Gibbs said, pointing to widespread criticism of Romney's initial response to the attack in Libya, as well as a protest at the American Embassy in Cairo that occurred the same day. @ bensweeney: if the administration lied in public interviews in order to not let those who committed the murders of those 4 Americans know we were after them and thus increase the odds that they would be found, would you be troubled? What do you think the average person upon the street would feel? So you agree they lied but with a good honorable reason that they know and we don't...We deal in facts, there has been no evidence to this possibility. Do you believe some form of unique interrogation is ok.? if someone has bad intent? Answering your question... Two weeks after the event go to United Nations and blame the video shows the world we are weak and afraid... in that moment... I believe this administration is weighing the Election date against world events and making foriegn affair decisions based on that. @ ben sweeney: incompetent leadership would have been revealing what was truly known to the public, and thereby, compromising tracking down those responsible. I view pointing towards that incidenary film simply as a way to further cloud what was known so as to increase the possibility of holding accountable those who murdered the 4 Americans, as well as to try to blunt any ill will towards Muslims who are in the fight with us to progress their cultures and countries. Do you find something wrong with that? I am not concerned with which political party is injecting politics into this. They probably both are, and ultimately it doesn't really address the important issues related to the tragic event ie what I listed out at the end of my first post upon this topic. Also, to clarify: I do feel that the Obama administration may have not been forthcoming with all details for the reasons I previously mentioned. It wasn't done in the spirit of cya as you imply and which few would agree with. I do not think the Obama administration was being purposely deceitful. I think they did know it was likely a terrorist attack, tried to squash further and perhaps worse events from being initiated by now emboldened terrorists, and were trying to keep those who did perpetrate the murders of those 4 Americans from knowing that we knew and were now after them. Some further realities: 1) we appear to be stretched thin when it comes to personnel and equipment, etc. and need to attempt to address it upon our own or hopefully, with aid of others, 2) we need to better secure and protect our most important assets, our highly trained and skilled people, 3) we are always being watched and adversaries will probe and exploit a perceived weakness, 4) sometimes bad things do happen, regardless of how much we do, and 5) we cannot ever forget it's all about doing what's best for the country and the personal and political agendas need to be placed aside.